We are so excited to introduce you to Olivia! Olivia is an amazing Wrapunzelista who recently shared a personal challenge that she created for herself on the Wrapunzel Community Page. We loved her challenge so much that we wanted to share more about it and her story here! Enjoy! Hello my name is Olivia Henderson. I was born and grew up in the Baltimore area. I have been married to the kindest and most loving man for nineteen years and have had the pleasure of raising three strong and beautiful young adults. The question of why I Wrap is complex. I could simply say it’s because I am a married Jewish woman, that it makes me feel pretty, or that It creates boundaries. My daughter tells me it’s just who I am. All of these answers are true, but I think the biggest reason for my wrapping journey is that I find it empowering. I have been on this wrap journey for many years beginning with the snoods and special hats bought for holidays, but I truly embraced covering full time when I saw a beautiful Israeli lady at one of my daughter’s ballet performances in a tichel. I was mesmerized by her simple elegant style. Soon after I discovered Wrapunzel and haven’t looked back. Now just because my family accepts my covering now, doesn’t mean it’s been smooth sailing. I thought most of the issues concerning my covering would be from strangers, but sadly it’s the ones we hold near and dear that are the challenge. During this time I got a lot of practice in patience, persistence, and perseverance. Lol. I say this to give fellow wrap sisters whose families are struggling with their choice to cover hope. They will come around given time. The Marrakesh Turban Challenge began as a fun way to test my skills with different kinds of scarves and maybe use those scarves that just sit and look pretty. After the first day I realized that I wanted to do more… in our collections there are scarves that are only for this wrap or that wrap and it’s probably the style that sold us the scarf. I met the Marrakesh Turban in the last 30 day challenge and liked it, but this uses a pashmina and that’s not warm weather friendly. It is also too fancy for everyday wear. Recently I got it in my head that I needed to challenge these ideas and that maybe by doing this it would push the imagination to see just how many other wrap boundaries I can change. Day one is the Scarf of the Month from November. I had to use this one with all of its splendid colours and details …. including a strip of Magen Davids!!!! Day two was chosen because of its simple elegance. Cotton fabric with a hint of shimmer. Day four was chosen because of necessity. Two days before a holiday means comfort and ease maintenance of scarf cleanliness is vital. Of all, I was surprised the most by how lovely this one turned out. Day five was all about a return to glamour. This scarf is smooth as silk and wraps like a dream. Day six was Harvest gold. This scarf is usually wrapped in partnership with its sister scarf in brown, never alone. It’s a rather simple scarf and yet it puts pizzazz into this wrap. Day seven I wanted to pick a special scarf to end my challenge and this embroidered silky scarf fit the bill. Due to its contrary nature I must admit this one is the most underutilized scarf in the closet. That may change. Check out the Marrakesh Turban tutorial here! Head Wrapping in the Professional World by Lila H.
Here it is! 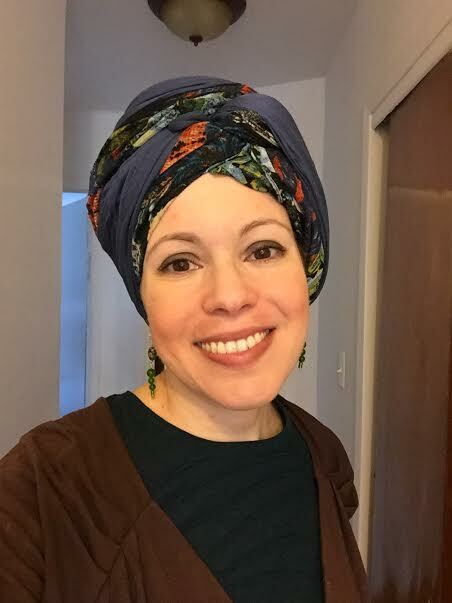 Part 2 of “Head Wrapping in the Professional World” by government agency worker, Lila Halpern Besser! Enjoy and take notes! Hi ladies! Andrea graciously asked me to write something about wrapping in the professional world. I understand not every “professional” environment is the same, but I wanted to share my personal feelings so that it may help someone have the confidence to wrap for work. A little about me-I’ve been wrapping since my wedding almost 2 years ago, and I live near Washington DC with my amazing husband. I met Andrea shortly after I got married through a mutual friend, and have been inspired by her in my wrapping. Some of you may recognize me from the Wrapunzel website (I had an awesome time modeling the midsummer line with Yehudis) and from the fangroup, where I post almost daily. Sometimes I need to see myself through a camera lens to see the outward image I am projecting for the world to see, and what better way to do that than sharing with the amazing and supportive Wrapunzel community. Everyone has a different definition of what is considered professional. I work for a government agency where all of the men (and some of the women) are in suits every day. Dress pants and blouses and sometimes sheath dresses are present as well. That is what “business professional” standardly looks like. And yes, while I love to rock the sheath dress as much as the next girl (see pics below), that isn’t the be-all, end-all of dressing professionally. First and foremost, confidence and tidiness are key. Even if you are in a suit, if you don’t hold your head high and your clothing is disheveled, you won’t look professional. And while wearing your tichel proudly, you allow your confidence to shine through. It may take a little practice to get a tichel looking neat and tidy, but master the Beginner’s Luck, the Regal wrap, and maybe a turban if you want and you will never go wrong. 1- A sheath dress with a cardigan or jacket, regardless of the color or pattern of the dress, is always an easy way to look put together (especially when your tichel coordinates with colors in the dress. 2- A line, pencil, or flared skirts, even in colors or patterns, are flattering and look great, but it always depends on the top. An outfit can hinge on a corresponding top. 3- Tops with collars, whether form fitting like dress shirts or a little more flowing, are amazing closet staples. Personally, I love the sleeveless, loose fitting button down tucked into a flowy or pleated skirt with a cardigan for a polished look. It’s pretty much my go-to most days. How do I express my creativity while still remaining professional? Part of it is the clothing I choose to wear, but tichels play a major part it in. Sometimes I want to do a fancy wrap with multiple scarves and feel creative, and some days I just want a simple Beginner’s Luck with my favorite sari scarf, or a turban with a T-shirt tichel. It all depends on how I feel, but my color choices in both my clothing and my tichels allow me to express myself and show the face I want the world to see. Do I feel constrained or more free in my wardrobe choices due to wearing a tichel to work? to pull it all together. What would I say to someone nervous about wearing a tichel on her first day of work? To be completely honest, I’ve been there. I started my job two months before my wedding, and the first day going back to work, I had a really hard time getting dressed. I had been planning on wearing a wide headband, but somehow it just didn’t feel right. My husband was watching this dilemma, and he told me to just wear a scarf. So I chose something neutral and understated (black/white/grey ombre 2in1 with a silver headband), and went to work. The first week, I got a few questions from my supervisor and co- workers, but I was ready with my response: “Some Orthodox Jewish women cover their hair after marriage, and that is what I have chosen to do”. And everyone accepted that. Over the next several weeks, as I became more comfortable, I started branching out with brighter colors and more intricate styles, and no one batted an eyelash. Do I still get funny looks in the bathroom sometimes? Of course. Do people occasionally ask why I cover my hair? Absolutely. Do random people stop me in the halls? All the time. But when I smile at staring people in the bathroom, they smile back. And I tell the people who ask that I cover my hair to signify my status as an Orthodox Jewish married woman and it is a part of my religion. And the people who stop me in the hallway? They usually just want to tell me they like my scarf, ask how I tied it, or where I got it. What are some of my favorite professional outfits I’ve worn? Everyone, I am so excited to introduce you to Elena Isabella, a woman who takes head wrapping to a whole new level! Love her story, her sense of style, and knowing that she is out there on her tiny island rocking these awesome scarves! My name is Elena and I live in Åland, a small island in between Finland and Sweden. I live here with my significant other and two cats. My mother lives right next door, it’s kind of like a sitcom at times. Lots of shouting and there’s always coffee brewing. Except for the two years I lived in Sweden studying to a makeup artist (among other things. I also took social psychology classes), I’ve lived here all my life. It’s quite isolated, everyone knows everyone and we’re always about two years behind, but I can’t think of a better place to live, really. Instead I travel as often as my bank account allows me. My favourite colour is teal and I will never miss an opportunity to make a bad joke or tell a random anecdote. I started wrapping a little more than a year ago. I’ve always liked the look of wraps, like the retro turbans and the flowing scarves from the 60’s and 70’s, but I could never get the fabrics to stay on my head, no matter the amount of bobby pins and hair grips. One day I found a video of Andrea tying a tichel. I had no idea what that was or who she was, but I binge watched pretty much every wrapunzel video available at that time, and shortly after, I orded my first velvet headband and a whole new world opened before me. My main reason for wrapping at that time was to let my hair rest. I hade fried it with bleach for the second time in 5 years and didn’t dare to do anything with it anymore. I had experimented with extensions and wigs for some time, but in the end it was too much of an effort, and a bit uncomfortable really. I used to say that I suffered from a chronic case of bad hair day. After some time I felt that I still couldn’t do the awesome wraps shown in the videos and went all in and ordered a Wendy and a bunch of scarves to experiment with. I found the Fan group and after many days of hesitating, I finally dared to join. After some months of weekend wrapping only, I realised that the scarves ment more to me than just covering bad hair (that was starting to improve whohoo! ), I had, in a way, found myself again. Flashback a few years, I had a rotten divorce that left me alone, confused and not sure about myself anymore. Style has always been a big part of me and I’ve always loved experimenting with my looks. But suddenly I didn’t feel like dying my hair bright orange anymore, makeup didn’t look right and I felt -old-. I didn’t want to be seen anymore, I was tired and just couldn’t be bothered to make any effort anymore. I just didn’t care. The scarves made me feel “cool” again. I felt more put together, more age appropriate and proud, and even if I didn’t realise right away, covering my hair has helped me let go of the bad times more than anything else. Life is fun again! I know living in a small area can be tough for someone looking different, but I’ve been lucky. I’ve always looked different, everyone knows who I am, one way or another. I’m either the tattooed postman-girl, Pia’s daughter (My mum used to work in a tax free store. Things like that will make you famous around here.) or simply “the makeup girl”. This is just my current “thing”. The wrapping community has given me the opportunity to learn more about the world, religion, philosophy and totally random things, like what to do with a butternut squash. I’ve found some amazing ladies I would now consider friends, that I probably would never met without this community, and I’m very grateful to have had the opportunity to get to know them. Can You Wear A Wrap as a Professional? Yes You Can! Hi everyone! Meet Arrianna, second year medical student who is rocking the wraps while doing training in an environment where professionalism is strict. This is Part 1 of our blog series on Wrapping in the Professional world. Enjoy! I’m a second year medical student. We had our first clinical exercise of the year at the VA hospital today. I almost didn’t wrap, concerned as we always need to be about strict professionalism while in our white coats. But in the end I did with a simple 2-in-1, and gold rose headband. My classmates loved it, and one patient’s wife even asked me how I did that, as her hair was thinning and she’d been thinking about starting to wear scarves. I didn’t have time to show her how to do the wrap right then, but I wrote down some information for her, and I hope that now Wrapunzel’s youtube channel has a new fan. My advice? Keep it simple, especially in the beginning until you really know your work audience and they’re used to you. In my situation, medicine is a fairly conservative profession and I deal with people of a huge range of ages, backgrounds, beliefs, socioeconomic status, hopes, and needs. I want the image I present to be professional, but not austere. When people see me, I want them to see a competent medical provider first and not to be distracted by my scarf, much like I wouldn’t want people distracted by my jewelry or my clothing. Being in healthcare and being around patients who may be losing hair for many reasons, I’m very uplifted by the fact that wrapping in this environment is going so well. Much of healthcare has an underlying theme of the effect of health problems on self-image, as hair (or the lack thereof) figures so prominently into our society’s idea of what makes both men and women attractive. Personally, I hope that wearing a wrap in the workplace will encourage those who may be too shy or embarrassed to talk to their doctor about hair loss to ask me questions. I would like them to see me and think: “there is someone who will help me without judgment”.